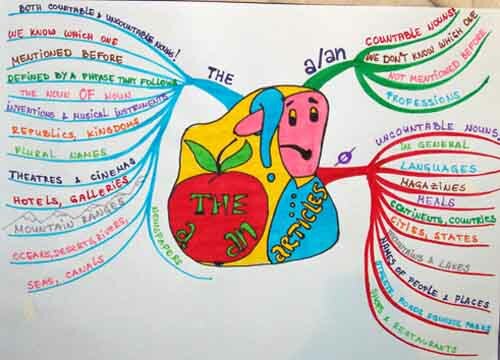 Don’t get discouraged when you see the panic-stricken face of the man with the question mark in the mind map! He is terrified at the thought of not knowing which article to use with the apple he is looking at. The bad news is: there are many rules! The good news is: you can print the mind map and stick it on your wall so that you can adopt the rules little by little! Anyway, let’s get introduced to the articles! We will start from the very beginning. There are two types of articles: indefinite (a/an) and definite (the) . As we can see in the map, there is, apart from the green and the light blue branch, the red one, which explains the use of the zero article (O) , which explains when we do not use any articles at all. Golden rule number 2: Never use plural nouns with indefinite articles! ( NOT: I saw a kangaroos in the zoo(?!?). CORRECT: O kangaroos). Use a before nouns beginning with consonants (for example: a book, a dog, a picture). Use an before nouns beginning with vowels (for example: an apple, an orange, an egg). • We use the indefinite article when we do not know which one . For example: Give me a chair! (I need any chair, or one chair, I’m not interested in any particular chair.) If we say, for example, Give me the chair!, it means that I know exactly which chair I need. • We use the indefinite article when we describe people’s professions. For example: My mother is a teacher, my brother is an engineer. • We do not use indefinite articles with uncountable nouns (examples of uncountable nouns: water, sand, money, rice etc.) So, we do NOT say: I eat a rice every day (?!?). CORRECT : I eat rice every day. • We do not use any articles when we talk about things in general . For example: People like O music. • We do not use articles when we talk about languages . For example: I like English and French. BUT we say: the English language, the French language. • We do not need articles when we talk about magazines . For example: My sister likes reading O Cosmopolitan. BUT newspapers take the . For example: My uncle reads the Times every morning. • When we talk about meals we do not use articles: What did you have for O lunch? • We do NOT use articles with the names of countries, continents, cities , states, mountains and lakes ! For example: Serbia (NOT: the Serbia ), Asia (NOT: the Asia ), Berlin (NOT: the Berlin ), Idaho (NOT: the Idaho ), Everest (NOT: the Everest), Michigan (NOT: the Michigan ). • We do not use articles with names of streets, roads, squares and parks . For example: Oxford Street (NOT: the Oxford Street ), Victoria Road (NOT: the Victoria Road ), Trafalgar Square (NOT: the Trafalgar Square ), Hyde Park (NOT: the Hyde Park ). And, finally, let’s analyze the light blue branch with most of the rules of the definite article (the) ! To begin with, the is the short form of this/that or these/those. • We use the with both countable and uncountable nouns, both singular and plural forms, when everybody knows which noun we are referring to! For example: Will you, please, pass me the salt? Or: The news passed quickly through the crowd outside the palace. • As we have already pointed out, we use the when we go on talking a person/thing/event etc. for the second time, that is, it was mentioned before. For example: I saw a dog in the schoolyard yesterday. The dog was dangerous. • We use the with OF phrases. For example: The advantage of living alone is that you can do what you like. Or: The beginning of the month was very difficult. (Please note that there are always exceptions in a language). • We use the when we talk about inventions and musical instruments: Who invented the telephone? The guitar is my favorite instrument. • We use the when we talk about republics and kingdoms. For example: the Dominican Republic , the United Kingdom , etc. • We use the when we use plural names: I like to watch the Simpsons. She lives in the States. • We use the with theatres, cinemas, hotels, galleries, museums: the Palace theatre; the Odeon Cinema; the Hilton hotel; the Tate gallery; the British museum, etc. • We use the with mountain ranges (BUT: we do not use the in front of mountains! ), for example: the Alps , BUT: O Old mountain. • We use the with the names of oceans, seas, rivers and canals (all water areas except lakes!). For example: the Atlantic Ocean , the Black Sea , the Danube , the Suez Canal , BUT: O Lake Ohrid . To sum up, there are many rules which we must apply if we want to speak correctly. When we talk about the use and non-use of articles, it is a never-ending story. But, don’t give up! Draw the map for yourself and stick it on a visible place in your room or working place and relax! You will adopt the rules gradually when you watch the map and do lots of exercises! So, don’t hesitate and start using the articles! Our Travel Assistant on TT Group portal is here to help with your travel plans. Currency information, maps, travel documents, tickets, recommendations for your amazing journey.